Missouri sweet corn season officially ends the last day in September. But, ever since I was a little girl, I came to associate corn with the month of October. The reason for this is that, as soon as the weather would turn cool, my mother would pack me into the car, and we would head off to the local farm to buy pumpkins, Indian corn, and corn shucks to decorate the front of the house. Back then I knew nothing about the seasonality of fruits and vegetables, all I knew was that shopping for wonderful fall things like these made me feel all warm and fuzzy inside. Those are good memories that I have with my mom, and I can't help but think about her and how much she enjoyed decorating for each season, when I pull out my autumn decor. Today I was looking for something different to make for dinner. A quiche sounded really good to me, but I also had quite a few ears of corn in the fridge, having recently fallen victim to a produce sale at the local market. 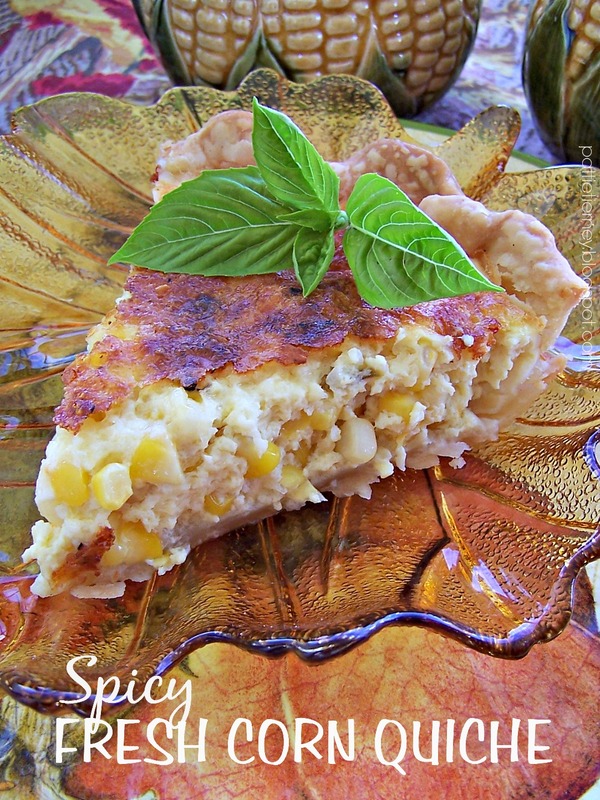 Rummaging through my recipe binder (that has an ample section of quiches), I decided to come up with one of my own, featuring fresh local corn. I had no idea how this was going to turn out, but it smelled heavenly while baking. I tend to be impatient when I pull a quiche from the oven, not wanting to allow it the necessary cooling time for things to settle into place before slicing. But, busying myself with other things, I allowed it to cool, and then dug in. It was wonderful! What a fabulous breakfast, brunch, or fall luncheon dish this would make. It is so easy to put together that you won't believe it. I wanted spicy so I used pepper jack cheese, but feel free to substitute your favorite white cheddar, Gouda, Swiss, or any cheese of your choosing. I think you're really going to enjoy this one, and I think the family will too. Combine first seven ingredients in the work bowl of a food processor. Pulse until onion is finely chopped. Add half-and-half and butter, and pulse until blended. Place corn kernels into your unbaked crust. Pour liquid mixture on top, spreading evenly. Sprinkle grated Parmesan cheese on top. Bake until filling is slightly puffed, and the top is golden brown, about 50 minutes. Remove from oven, and allow to cool on a rack 15 minutes before slicing. **I don't bake, so I don't make pie crust, I used one from Pillsbury, but feel free to use whatever you like. This recipe sounds and looks delicious - I am definitely going to give it a try! 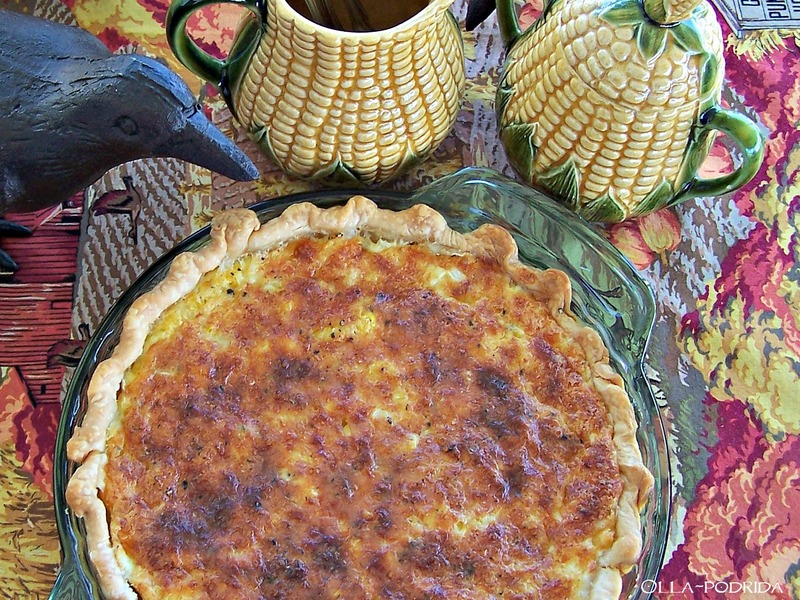 I love the photo with the crow peeking in at the quiche. It's a good thing he is not real because that slice would disappear pretty quickly! 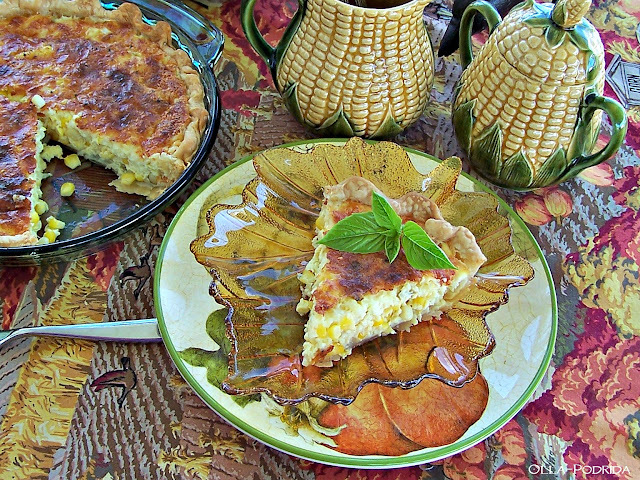 I'd have never thought of corn quiche but it looks fabulous! 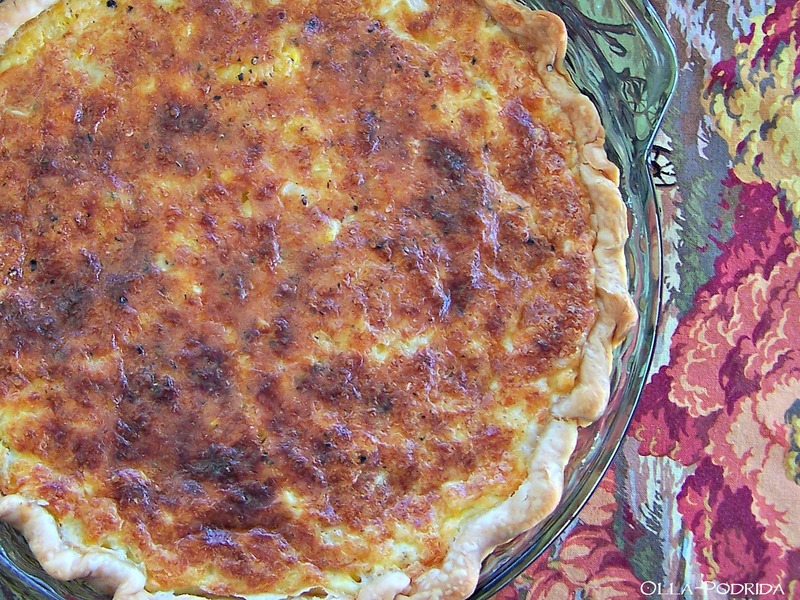 We love Quiche and your recipe looks delicious! Hope you are having a fantastic weekend and thanks so much for sharing your post with us at Full Plate Thursday! This sounds so good - had to pin! Thanks for sharing at the What's for Dinner party! Tasty Tip Tuesday: Save Your Scraps!